Thoroughly wash potatoes and puncture them with a fork to al low steam to escape. Bake potatoes in a metal pan at 350 degrees for one hour (they can also be microwaved for a quicker method). While potatoes are baking, in a large Dutch oven, cook bacon over medium-high heat until crisp. Add onions and salt and cook until onions are clear. Add beer, vinegar, and cabbage. Cover and cook until cabbage is wilted, but slightly crisp. Stir in mustard and herbs, and remove from heat. Sprinkle with Swiss cheese and allow to bake for a few minutes until cheese is melted. Cut potatoes in half and scoop out some of the potato. 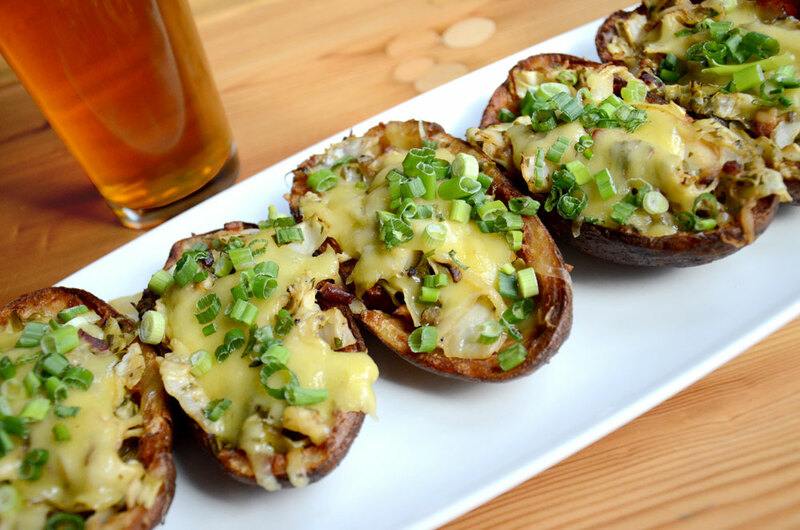 Fill potatoes with cabbage mixture and garnish with green onions.